First, a little about me. I'm Doug Turner, the owner of TCF. I consider myself an artist working with wood as my medium. This self-definition isn't intended to sound fancy or hip - I simply find that this definition suits me better than any other. I own a small which hand-crafs exceptionally high quality furniture. I take my time to get the details right, and try to avoid the ordinary. I work closely with clients to develop designs which are both functional and aesthetically pleasing. The first step is the basic idea: what is the problem you are trying to solve? From there, I'll ask you a series of questions concerning style, dimensions, functionality, special requirements etc, designed to zero in on the finished design. As we approach the completed design, the drawings, such as this design for a stand-up desk, will get more refined. When you are completely satisfied, I'll ask you to sign the drawing. From there, I'll proceed to fabrication. It is possible to change the design once fabrication has started. The resulting change may increase or decrease the price, sometimes dramatically. Some changes may not be possible, such as a complete change in materials if we are well into fabrication. Wood samples are usually provided during the design process, but often overlap into the fabrication phase, as some clients are able to choose the type of wood they would like to use quickly, but take quite a while to choose the color. Some woods work better with different styles. Refined woods, such as macassar ebony or rosewood work well with Art-Deco and contemporary pieces. Rustic white oak works best on simple farmhouse style or historic pieces. TCF will make wood recommendations, but the final choice is up to the client. Once a design is approved and signed, I will place your project on the production schedule and give you an estimated delivery date. In all honesty, we are not the fastest furniture makers around. If we feel the need to take some extra time to get a project right, we take it. Most clients will forgive overdue projects, but few will forgive poorly fabricated ones. As we work, we'll send you photos to update you on our progress. An easy way to see exactly what's happening on a daily basis is to "Like" us on Facebook or Instagram. We post in-process photos regularly. TCF rarely delivers work, with some exceptions. Why not? Simply put, we are a small furniture making company, not a delivery service. A specialized delivery company is set up to deliver expensive furniture, and is insured to pay for any damage which is incurred during delivery. Most clients arrange their own delivery, but TCF will be happy to make a recommendation. Delivery charges are not included in the price of furniture. Many clients choose to pick up smaller pieces themselves, which saves money. If you are out of state, I recommend requesting a quote from a shipper before fabrication begins. Shipping rates vary widely, based on the size of the item, the weight, and the delivery location. Some shippers require furniture to be crated. I can make a crate for an additional fee. Knobs, bin pulls, hinges, locks...You've got a lot of choices when it comes to selecting the hardware for your furniture. TCF can help. How to choose the right hardware. Hardware serves a utilitarian function, but it can also be considered "furniture jewelry". The choice of hardware can make or break a piece. Here are a few simple guidelines we use when making recommendations to customers. Style - Let the style be your guide. Art Deco pieces favor silver hardware. Dark traditional furniture favors brass. Contemporary light toned furniture favors brushed nickel. Simple vs. Complex - Is your piece of furniture complex or simple in design? Select simple, clean hardware for simple designs, and more complex hardware designs for more complex pieces. Elements - Does your piece feature a lot of curves? Pick a round or curved knob or pull. Lots of squares or angles? Select a more geometrically designed pull. Contrast - Think about the light and dark values in both the furniture and the knob. How striking do you want the contrast to be? 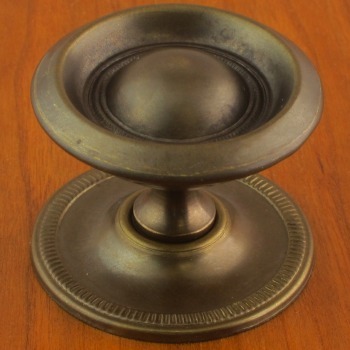 Dark mahogany with an aged brass pull gives a low contrast, old-world feel. Dark macassar ebony with mirror finished silver yields a striking "look at me!" feel. These are, of course, just guidelines. And rules and guides can, and should be broken from time to time. But we find the use of these guidelines helps to narrow the choice of hardware, which can be overwhelming.